Added on July 15, 2017 by Stella Chapman. 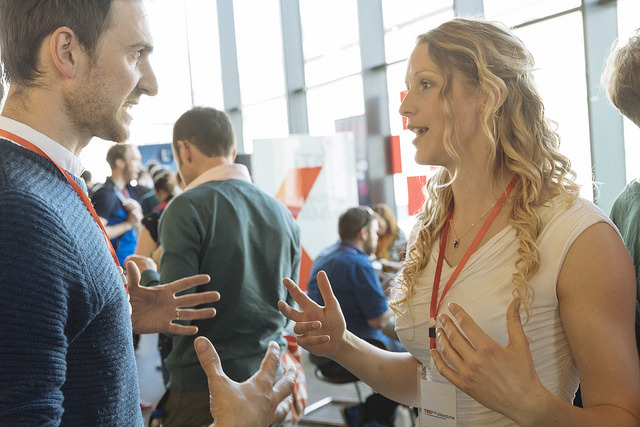 When TEDx came to Folkestone for the first time, we were thrilled to be there. The day of inspirational talks at the Quarterhouse gave 13 local speakers the chance bring TED's mission of 'ideas worth sharing' to the town. The theme of the day was 'pushing the boundaries' and although none of the talks were about design, a common theme was creativity, and how creative thinking can improve our experiences. Here are our highlights, and if you're inspired to hear more, all the speaker videos are available on YouTube. Illustrator and educator Jim Lockey invited us to 'make our mark' and follow his instructions to do a simple drawing – proving everyone can be creative. He believes drawing should be a pleasurable form of expression and a visual language, not something to be measured against accepted standards. We particularly liked the idea of his mobile comic factory, a social arts project aimed at giving young people access to the arts and giving them the confidence to try something creative. Jazz vocalist Randolph Matthews didn't exactly deliver a talk – but an original and witty performance about using the power of our voice. His music and stories also reminded us of the value of observing and absorbing the world around us. We loved business writer Paul Brassington's phrase 'corporate robotic' describing the depersonalised way some companies speak to their audiences. Plain speaking and honesty leads to a more fruitful and intimate dialogue than when companies write everything down in a manual. As Paul explained, we relate better to people than to 'things'. Emily Peasgood, a composer and sound artist, had no problem with honesty and shared her highly personal story. Success and fulfilment came when she stopped suppressing her off-beat creative ideas that usually met with the response "Emily! Don't do that!". Her music challenges the norm and her piece 'Lifted' was recently performed at the Royal Festival Hall – in the lift of course! Emily Peasgood - Emily! Don't Do That! Social entrepreneur and care innovator Chris Gage explained how a little creative thinking could go a long way to enrich the experience of people in long term care, something 1 in 5 of us will rely on. He used the example of a simple prop or an meaningful activity to spark a memory or create a connection which can make all the difference to someone's day. This talk was timely for a current project of ours, designing a brand identity for a care app which uses technology to achieve this aim. Salt were honoured to play a small part in this massively successful event which bought together Folkestone's amazing creative community and gave us another opportunity for collaboration. We had the chance to be involved from the start, supporting creator Liu Batchelor and the team with design for the programme and signage. But we were still blown away by the quality of the talks on the day, and by the amazing production and atmosphere. We left feeling inspired and motivated to step out of our comfort zone more often. We were reminded creativity is about 'pushing the boundaries' – exploring, inventing, experimenting and most importantly – sharing. 3. & 4. TEDx Event Branding Flourish, Illustration Cognitive, Literature & Signage Salt. TED Talks are influential videos from expert speakers on education, business, science, tech and creativity. TEDx is a program of local, self-organised events that bring people together to share a TED-like experience. At a TEDx event, TED Talks video and live speakers combine to spark deep discussion and connection.